Austria’s ÖBB class 1016, 1116, 1216 locomotives are part of the Siemens Taurus (Latin for Bull) family of high-performance electric locomotives. 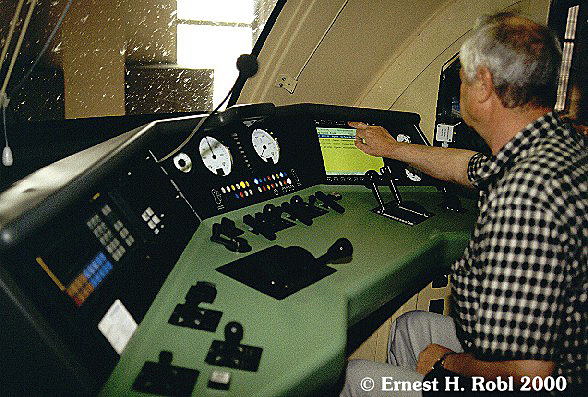 These were developed in cooperation with the Austrian Federal Railways (Österreichische Bundesbahnen or ÖBB) at the beginning of the 21st century. Siemens has since also sold versions to other European railroads and locomotive leasing companies. Siemens offered some for lease itself. 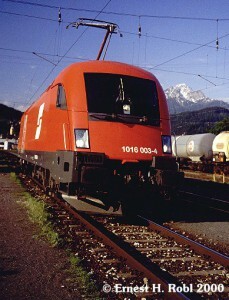 ÖBB 1016 003-4 in the early morning light at Innsbruck, Austria, in the spring of 2000. This was one of the very first batch of Austrian Taurus locomotives and was brand new at the time. With a top speed of 230 km/h (140 mph), these locomotives are suitable for both hauling fast passenger trains (such as Austria’s Railjet service) and heavy freight trains on steep mountain grades. The locomotives have multiple unit (MU) capability, allowing them to be used on push-pull trains and in tandem when needed. They can also MU with some older MU-capable locomotives, such as the Austrian series 1144. Another look at ÖBB 1016 003-4 at Innsbruck. As I was able to ride this locomotive for a short distance, of course I have the Roco model with that operating number. And, yes, my model has more than one person in the cab. The locomotive has the older ÖBB logo. All locomotives of this family have four axles, each driven by an AC traction motor. Most of these locomotives are equipped with the LZB German cab signal system used on German high-speed (ICE) lines and can therefore operate on those lines when hauling passenger stock suitable for high-speed operation, including Austria’s signature Railjet service. Taurus III (ÖBB 1216 / Siemens ES64U4): A further development that was conceived from the beginning with capability for three different voltages, therefore normally used on border-crossing trains. Though generally similar to the previous versions in external appearance, it has a different operator door configuration and somewhat different interior arrangements. The number and arrangement of pantographs varies with planned assignments and the purchasing railroad. 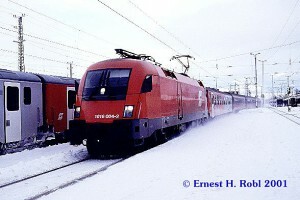 An Austrian-owned 1216 set the world record speed of 357 km/h (220 mph) for conventional electric locomotives. This locomotive was not substantially modified for the tests on a high-speed line. The record-setting locomotive later received a special paint scheme (models of which are available) and continues to operate in regular international service. These locomotives share many components, simplifying maintenance and the stocking of spare parts. Locomotives of the Taurus family are expected to be in operation at least through 2035. In December of 2001, ÖBB 1016 004-2 sends snow flying as it heads a train of both domestic and Eurofima long-distance coaches. Many of the Austrian and some of the Hungarian Taurus locomotives have received special paint schemes or commemorative “wraps” to celebrate special events or to honor historic figures. The Taurus locomotives are particularly suitable for such treatment because of their large flat surfaces and smooth ends. One interesting aspect of the Austrian Taurus locomotives was that the ÖBB purchased many of these as “kits” from Siemens – subassemblies only – and did the final assembly itself in its own shops. Unlike some other European countries, Austria has long focused on acquiring mainline electric locomotives that were “universal” – suited for both passenger and freight operations. Though some Austrian Taurus locomotives – particularly those in the Railjet paint scheme – are semi-permanently assigned to specific services, these locomotives are interchangeable, as long as they possess the appropriate electrical and signal systems for their intended routes. Though not common, there have been cases of Railjet locomotives being used on other trains and of non-Railjet painted locomotives used on Railjet trains. Though large numbers of these locomotives were produced for various customers, Siemens considers the Taurus series closed and does not plan to build further examples. The Taurus has been succeeded by the Siemens Vectron series, which incorporates many of the features of the Taurus line. The Vectron line was designed from the beginning as a multi-system locomotive, though customers can select which modular components are actually included in the versions they purchase. Models of Taurus locomotives have been available from various European model manufacturers for many years – in most cases with the first model versions reaching the market around the same time as the first prototype versions were delivered. Many of the special commemorative wraps applied to various prototype locomotives have also been available in model versions. As these wraps or special paint schemes typically operated for a limited time – typically about a year – these locomotives represent a slice of time. Model manufacturers typically consider these special schemes to be one-time limited runs – with no more to be produced once the initial run is sold out. Models are also available of Taurus locomotives sold to other countries and to private operators and locomotive leasing companies. That means that a collector trying to acquire all possible versions of the Taurus family, even from a single manufacturer such as Roco, faces a really daunting task — particularly as each year’s new model list usually included a few more versions of the various Taurus locomotives (Once a model manufacturer has done the basic tooling for a particular locomotive model, new versions with different numbers or paint schemes usually involve only a minor additional investment. Yes, some European collectors do pride themselves on the wide range of these locomotives that they own. 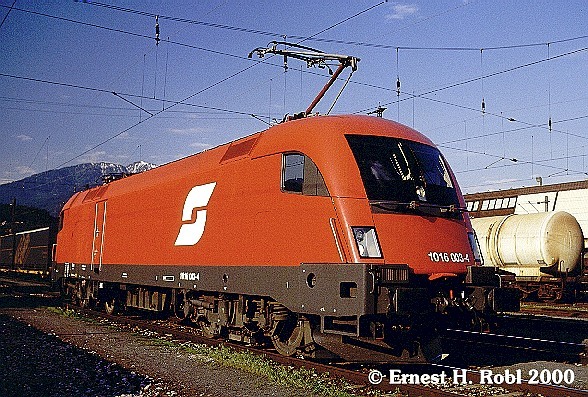 In the next installment of this series providing a quick overview of the mainstays of modern Austrian railroad operations, we’ll look at the Austrian series 1044/1144 of electric locomotives.